Fall at Camai Bed and Breakfast in Anchorage, Alaska is time to prepare for winter. We have put up storm doors for both the private entrances to our Fireweed Suite and Rose Suite as well as replaced our original garage doors. The storm doors are keeping our bed and breakfast guests warmer because there is less air leakage. The garage doors mean we will use less energy to heat our two garages. To make the Bed and Breakfast more energy efficient and ultimately warmer for less money we had an energy audit this past week done by Energy Smart Alaska. The preliminary report is that we need to insulate around all the windows’ moldings, insulate all the outer walls’ electrical plugs, and to insulate the ceiling’s can lights on our upper floor. It will be tedious to do yet should have good energy savings. Leaves have been raked and cleaned up. I hired C’s Services this year. They recently became an associate member of the Anchorage Alaska Bed and Breakfast Association. I was extremely pleased with their work. I’ve removed all the dead plants removed from our flowerbeds. Sadly I did not have time to plant the tulips before the ground froze. Now all we need is for it to snow. Today looks like the day snow will finally come. Termination dust (snow) has been creeping lower and lower on the mountains. 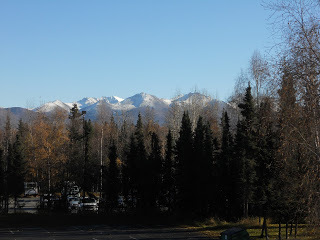 The picture is of the Chugach Mountain range and was taken earlier this month. I hope the Halloween Trick-or-Treaters come early this evening before the snow.